Goodreads Giveaway - Please Share! Rachel and I are super excited to be hosting our first signed paperback giveaway for FIRST CONTACT - please enter to win and share the contest with your friends! I am in the process of recording the audiobook for First Contact - whew! It is more work than I thought it would be and lots of fun! I'll keep you updated. 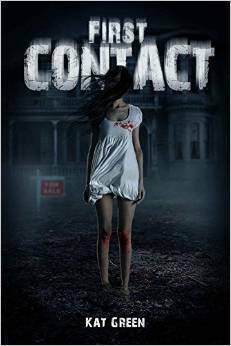 5.0 out of 5 stars First Contact's First Impression, August 21, 2014 What a great book! Couldn't put it down. This is an exciting new book series and I cannot wait for the next book to come out! It has a little of everything and appeals to everyone! Buy this book! 5.0 out of 5 stars I thought this was a great book and look forward to more in the series ..., September 6, 2014 The storyline intrigued me from the start and then I couldn't put it down. I thought this was a great book and look forward to more in the series to meet these characters again. 5.0 out of 5 stars NONSTOP PAGE TURNING!, September 3, 2014 I bought this book to read on a 3 day vacation, however I ended up reading it in ONE DAY! I just could not put it down! Great book. I'm looking forward to the next one! 5.0 out of 5 stars I loved the book and read it in one day, September 6, 2014 I loved the book and read it in one day. I just couldn't put it down. It is a must read and I can not wait for the next book. 5.0 out of 5 stars ... hard time putting this book down it was an excellent read from beginning to end, August 23, 2014 I had a hard time putting this book down it was an excellent read from beginning to end. I would highly recommend it.